The very first day of Fall Fashion Week has officially begun! Think NY fashion week, but a MRS rerun. Many of you well know that it isn't very often that the MRS freely bestows, except for fabbiness, love + design of course! 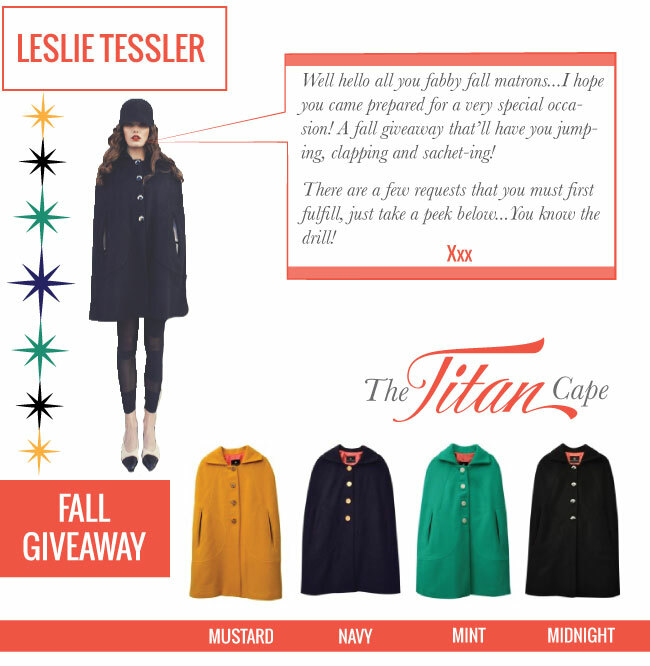 Long behold, the Mrs Crew + Leslie Tessler have decided on a cape giveaway...let’s face it, we ladies can’t bear the thought of a fall wardrobe that’s démodé and passé. Here at Mrs. Lilien Enterprises we are strong believers that those deserving of such prizes bear with them creativity + fabulous-ness beyond normal capacity. *The uber fabulous + creative winner will be chosen by tomorrow AM!! Happy rhyming!! Major luck to all who enter!